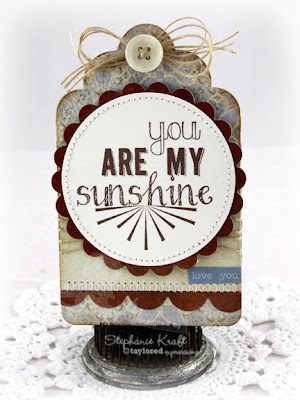 HandKrafted by Stephanie: Authentique / Taylored Expressions Project Blog Hop Day 2! Authentique / Taylored Expressions Project Blog Hop Day 2! 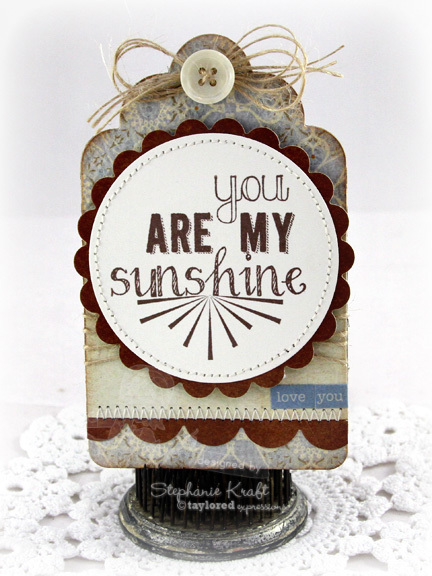 Taylored Expressions and Authentique have partnered together for a fun blog hop featuring some of the new Authentique collections and TE stamps & dies. Some of the designers on both teams have created projects to share with you for this 2 day hop! Welcome to Day 2! If you missed Day 1, you can start hopping HERE. If you'd like to start at the beginning, today's hop begins at Taylor's blog, HERE. If you are hopping in order, you should have come from my incredibly talented Baker's Dozen teammate, Wanda Guess' blog. I have a couple of projects to show you, so get comfortable and settle in for a bit! Authentique was quite generous in supplying us with their gorgeous products (thank you SO much! ), so I made a couple of projects! My first one is a layout that I created using the Authentique Strong collection. It is perfect to capture moments between Sabrina and her dad. In my layout below, I included a few photos from a recent spring break trip to Guadalupe National Park. The layout tells the story of how Sabrina isn't the biggest fan of hiking, but luckily she has her dad to help her through it. I loved combining the beautiful patterns and elements from the Strong collection with some TE stamps and dies. I layered a couple of patterns ("enduring" and "handsome") and stitched them together. For my title, I added a Stamp Blocks die cut from the collection. It reads "You're the BEST". To complete the rest of the title, I used the Poster Graphic Alpha to die cut "Dad" (I used paper from the 8x8 collection and chipboard to make my letters thicker). 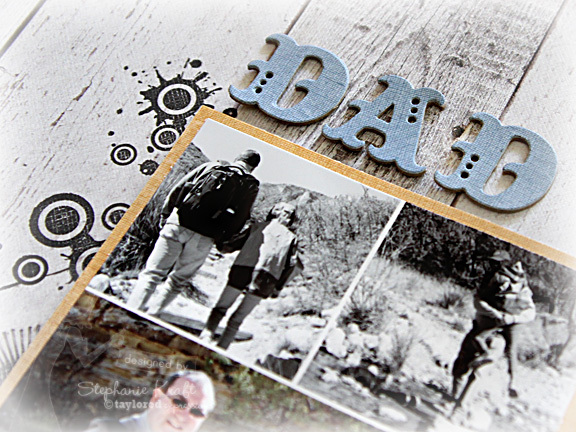 In the shot below, you can see the "Dad & Me" circular die cut (from Circles & Scallops) and I added the date to a die cut from Hinges & Tabs. I used the Notepaper & Clipboard Die and stamped the Notepaper lines before I hand wrote my journaling. Finally, on the lower part of the layout are more words to support my journaling. I stamped you're my hero (also from You're My Hero) onto the backside of the one of the Stamp Blocks die cuts, added it to a banner (using Banner Stacklets 1) and popped it up. "Wonderful You" is part of the patterned paper. 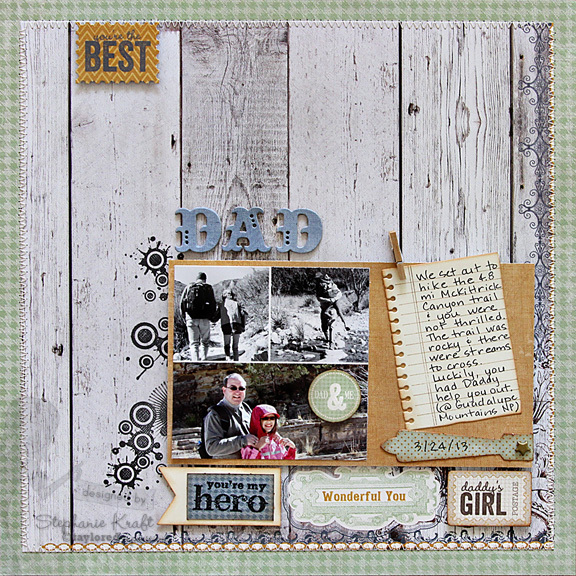 And the Daddy's Girl postage stamp is also from Stamp Blocks. My next project is a set of simple tags using the Authentique Hope collection. 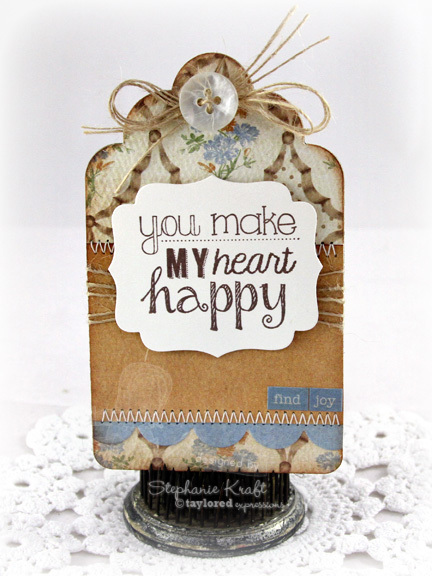 All sentiments are from TE's Happy Heart stamp set. I also used several TE dies and some word stickers from Authentique. For each tag base, I die cut the largest die from Tag Stacklets 1 onto chipboard and set those aside. Next, I created the "tag top" by layering different patterns from the Hope collection. I added a scallop (using the Medium Scallop Border), stitching and tied some twine around the centers. Once I finished those steps, I adhered my tag top to the chipboard base with red line tape to create a sturdy tag (this also helps to hide the stitching and twine on the backside). 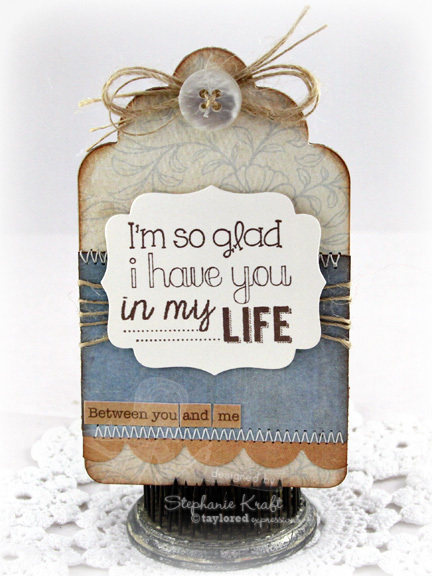 Each sentiment was stamped onto Choice Buttercream cardstock, then die cut and popped up with foam tape. I tied twine bows and added a button to the top of each tag. Above sentiment: used Spellbinders circle and scallop circle dies. Above sentiment: used Label Stacklets 1 die. 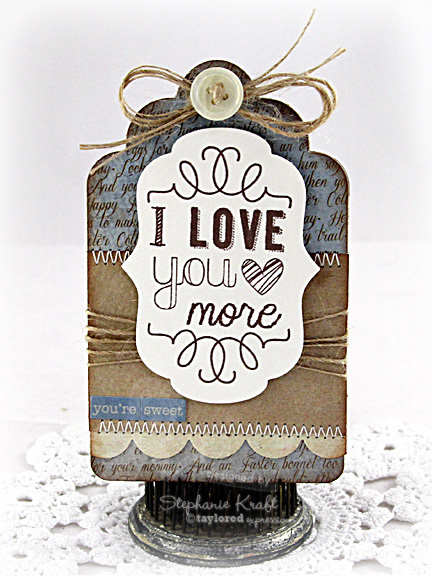 Above & below sentiments: used Label Stacklets 2. Taylored Expressions is offering a coupon code TENOFFDIES. You will save 10% off any in-stock dies. The offer is good from April 11, 2013 until 11:59pm CST on April 19, 2013. Please note that the code is case sensitive and not available on wholesale orders. There will also be an Authentique/Taylored Expressions prize pack (this will consist of a mix of Authentique products and TE dies ---> which if you aren't already aware, coordinate wonderfully together)! The winner will be chosen from comments on ALL blogs over the two day hop. 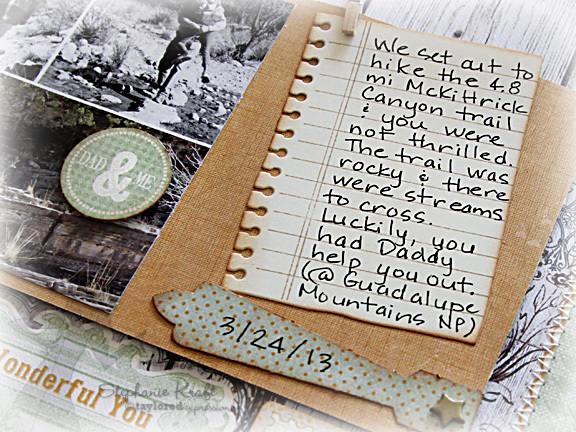 You have until Monday, April 15, 2013 @ midnight PST to leave your comments. Accessories: Taylored Dies: Banner Stacklets 1, Notepaper & Clipboard, Poster Graphic Alpha (Taylored Expressions); Star brad, Mini clothespin, Chipboard, Foam tape, Thread, Sewing machine. 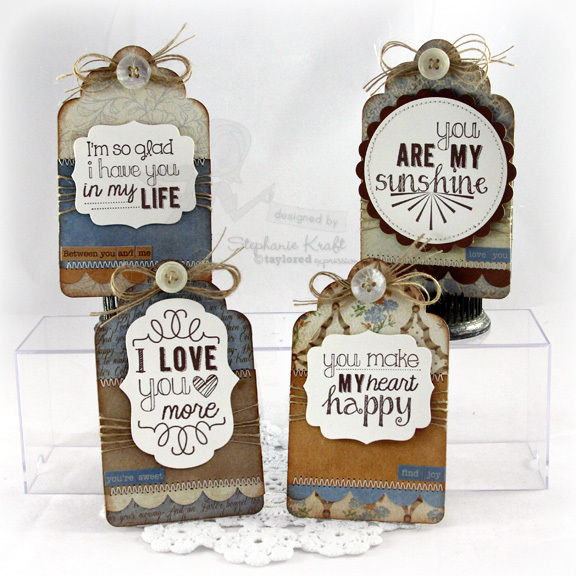 Accessories: Taylored Dies: Tag Stacklets 1, Medium Scallop Border, Label Stacklets 1, Label Stacklets 2 (Taylored Expressions); Standard Circle and Scallop Circle Nestabilities (Spellbinders), Buttons, Natural burlap twine (May Arts), Foam tape, Thread, Sewing machine. Oh wow..I love the tags with the sentiments and the layout is wonderful! Your projects are uh-mazing! Great job! Your layout and tags are just amazing. Seriously stunning Stephanie! the layout and tags are wonderful. every dad needs a little girl! I just ordered the tag dies and I'm so excited. Your tags are BEAUTIFUL and give me lots of inspiration! You are rocking these layouts, Stephanie!! You will have so much fun going through them all at the end of the year :) Love the tags too! The projects are magnification! The layout is just perfect and the tags are amazing! GOsh, I love the layout and the little tags so much. You picked great papers for your dad's layout. Very manly. And the notebook paper. Nice. Gorgeous layout and tags! I love this Hope collection. Products that are awesome inspiration to work with. WOW!! I adore everything about your great Dad layout. The tags are gorgeous too, but you layout is amazing. Thanks for sharing. Wonderful projects! My favorite is the layout, I love the stamping you included, it adds so much! Gorgeous papers and dies on your layout and tags! Beautiful projects! Thanks for showing to great but different projects. I am all about tags. Love the layout! What an inspiration! Thanks so much for sharing! Fabulous! Awwww, your journal piece on the layout just melts my heart. Lovely page. Your layout has so much texture. And you can never have enough tags. I LOVE AUTHENTIQUE paper!!! Cool layout and I love the combination of papers for the tags!! amazing set of projects!! the layout is absolutely gorgeous!! Absolutely love the tags...so rich and classy lloking! Fabulous! Love love love the tag set! you are a very talented crafter! Love you layout! These tags are absolutely gorgeous. I love the stamps as well. Guess I am going back to look again. Thanks so much for the ideas for "boy cards" ... most helpful. Oh my! That page shows off the paper so great! I LOVE the paper in the tags! Such great colors! My dad would go crazy for this beautiful card! nice tribute to dads,sure do miss mine! Your tags are simply charming! Wonderful tags and love the layout! Cute tags and sweet scrapbook page! I love the colors you choose and the sentiments! Thank you for sharing! I love the scrapbook page. Great tags and layout. I love the sentiments AND the masculine colors. Wonderful layout and wonderful tags! What a great L.O. (and the tags too). But I love the L.O...perfect balance. the look of boards for the white space is awesome. I love the font on "DAD". Your tags look wonderful. I like the dark colors. Awesome layout and tags!! Authentique Strong Collection was just so perfect for your layout theme (strong, endearing and handsome) and the sentiments just worked so well. Love the stitching, twine and the button details on those tags ( such unique variety of tags)love the expressions!! Really cute layout and tags. Such a sweet layout and darling tags! wow so much goodness on here! I love your layout with the stamping in black! Beautiful tags too! Beautiful projects! Love the colours! Fabulous fabulous layouts! Great use of the paper (woodgrain!) and TE! Wow, love your layout and your tags. These papers are just perfect for your projects. This is a great layout! You have given me some ideas as I'm just getting started on scrapbooking and have just found the pictures of my dad. Love your beautiful layout & your lovely tags. Well done! Thanks for the inspiration! Thanks for giving us two projects. The SB layout is super. The paper and color combos on the tags are terrific.